"The article provides an excellent summary of how rising air temperatures are leading to drier conditions and more fire activity among forests in parts of the western United States. 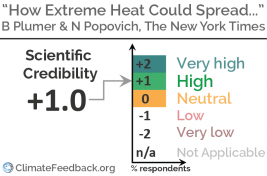 The article is strengthened by including multiple interviews with scientists who have produced seminal studies of fire-climate interactions in this region." "A well written article that captures the essence of our understanding that under climate change storms will likely bring more rainfall. In the case of Harvey, all we can say is that it is consistent with those ideas. But we cannot say that it is the direct consequence of climate change." 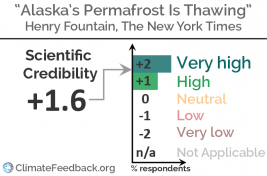 "The article is accurate in its descriptions of the physical and ecological processes that are behind permafrost changes. It also does a good job of getting across the nature of the work of actual scientists working in the field, what they are doing and why they are doing it." 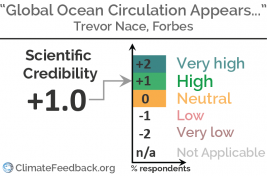 "This is an accurate, concise summary of the slowdown of the Atlantic Meridional Overturning Circulation (AMOC) and its possible future states. There are a couple of minor issues: specifically, one of the links goes to an irrelevant article, and it would be useful to have a couple more citations to the scientific literature. The title is possibly a little overstated; I might instead say that the AMOC is at risk of collapsing in a warming world." 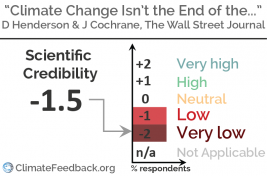 "This is a very simplistic, almost naive op-ed on climate change impacts. 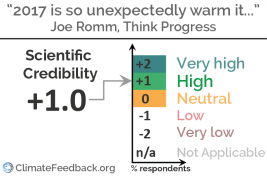 Some assertions such as the one about CO2 being good for plants demonstrates that the authors do not know or understand how increasing CO2 is good or bad for plants, they are just repeating something they heard." 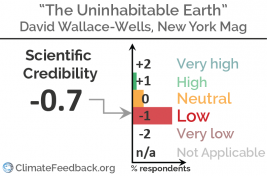 "While it is clear that ongoing warming of the global climate would eventually have very severe consequences, the concept of the Earth becoming uninhabitable within anywhere near the timescales suggested in the article is pure hyperbole. 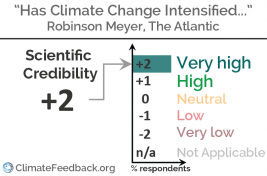 The author has clearly done very extensive research and addresses a number of climate threats that are indeed major issues, but generally the narrative ramps up the threat to go beyond the level that is supported by science." 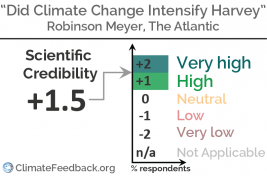 "In a cursory attempt at both reporting and climate science, the author glibly highlights a document heavy on accusation and light on reasoned engagement with fact. 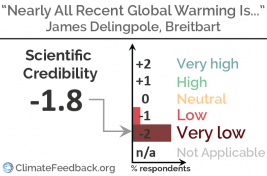 Implying nefarious motives behind temperature measurement bias correction without providing readers any indication of why this is necessary is misleading and a dereliction of the author's journalistic responsibility." This story in The Atlantic by Robinson Meyer describes a new study on the distribution of economic impacts that result from continued climate change in the United States. The study finds that the impacts would not be uniform throughout the country, but would reduce GDP to a greater degree in southern states, for example, while the northernmost states could experience net economic benefits from warmer temperatures. "The study’s claims all appear to be based on sound, peer-reviewed research. 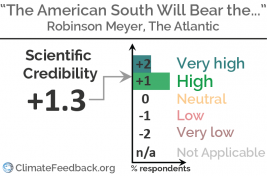 The claims are in line with longstanding predictions and are not cherry-picked or unrepresentative, although there are uncertainties as always in any prediction."